HESCO, a leader in the design and engineering of defence products and perimeter security solutions, add a hostile vehicle mitigation access control product to their TERRABLOCK range. 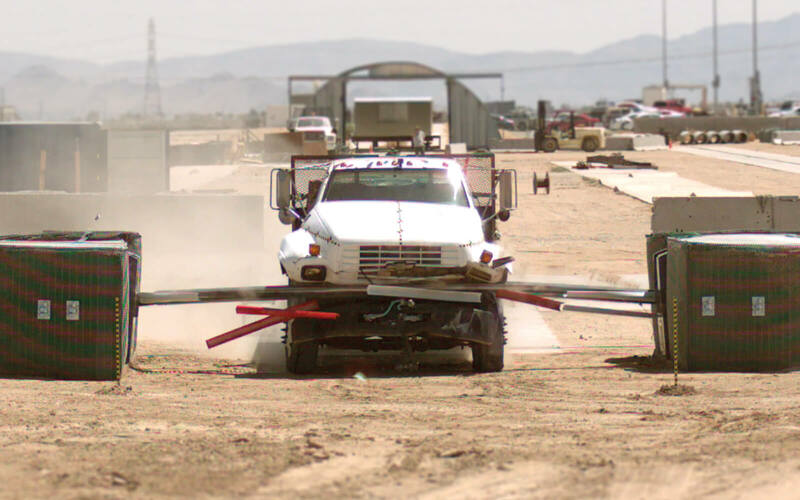 In 2017, Hesco launched TERRABLOCK, a completely surface-mounted hostile vehicle mitigation perimeter fence, engineered for critical infrastructure security and urban asset protection. This year, at International Security Expo, Olympia London, Hesco announce the new TERRABLOCK Rising Arm Barrier (RAB). Impact tested at Karco, California, TERRABLOCK RAB was installed in under six hours, joined with the HESCO Energy Transfer System to HESCO earth-filled units. With zero ground work preparation the barrier stopped a truck weighing 6800kg travelling at 40MPH. The barrier brought the vehicle to a complete stop within 5-meters, ensuring that any following vehicles and hostiles on foot were unable to pass around the vehicle to enter the site. The beam also remained fully intact on impact. Hesco brings decades of military experience to the civilian security market, understanding the ever-changing threat levels and the need for a rapid solution that can protect people and assets whenever and wherever needed. Hesco Representatives will be available throughout International Security Expo, Olympia London, 28th -29th November, Stand G30.